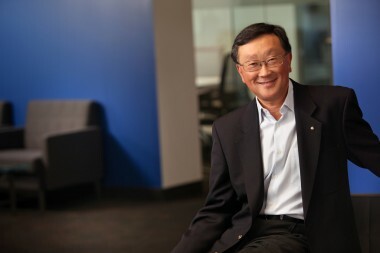 BlackBerry CEO John Chen insists that he has put in place much-needed changes that will help turn around the struggling phone maker. “It was important to make swift and impactful changes to ensure that our customers’ investments in BlackBerry’s infrastructure and solutions are secure,” Chen wrote in an op-ed for CNBC that posted on Monday. Chen has made some key changes, most notably outsourcing a chunk of device manufacturing to Foxconn and reorganizing the company around a few key areas, including services for businesses, the BBM messaging product, the handset business and the world of non-phone devices that use the QNX operating system BlackBerry acquired a couple years back. He’s also committed the company to being profitable by fiscal 2016, canceled some planned products and spiked plans for a major customer conference for 2014. However, the bigger challenges remain those that BlackBerry has faced for several years now. While some BlackBerry-dependent businesses have remained loyal, many other corporations have opened up to iPhones and Android. Meanwhile, demand for new BlackBerry 10 phones has been anemic, leading BlackBerry to take huge charges reflecting the large volumes of unsold inventory for those products. In his piece, Chen points out that BlackBerry remains the leader in the business of managing mobile devices, larger than upstarts Mobile Iron, Good and AirWatch combined. BlackBerry has made some moves to transition its server software to manage those rival devices, in addition to BlackBerry phones. It has also, for the first time, allowed BBM to run on non-BlackBerry devices. Chen also promised to continue to use QNX, which BlackBerry bought to form the basis of BB10, for non-phone devices. “Already the dominant machine-to-machine technology of the automotive industry, new capabilities and cloud services are being unveiled at CES in January, and we’re looking toward adjacent verticals for expansion,” Chen said. There QNX is ahead of rivals, but faces increasing competition as Apple lands automakers for its iOS in the Car initiative and Google is reportedly aiming to do something similar with Android.